This report was prepared by RTI International for the Office of the Assistant Secretary for Planning and Evaluation, Office of the Secretary, and the Office of Family Assistance, Administration for Children and Families, United States Department of Health and Human Services, under Contract Number HHSP23320062920YC, September 2006. The views, opinions and findings expressed in this document are those of the report authors and the researchers whose work was included in the review and do not necessarily represent the official positions and policies of the United States Department of Health and Human Services. 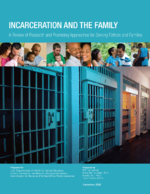 More information about the Evaluation of the Marriage and Family Strengthening Grants for Incarcerated and Reentering Fathers and their Partners is available.